TORONTO, ONTARIO — Grilled food, superb music, terrific friends and obviously, cold beer. There are many reasons why I love to visit the Toronto’s Festival of Beer but this year the number one reason is Canada. One cool thing that Beer Fest does every year is highlight the contributions of different countries and breweries from around the world (Ireland was the guest in 2015) but this year the focus will be on home sweet home. Visitors can look forward to a 20,000 square-foot area completely dedicated to the fine tastes of Canada, allowing patrons a taste of the brews and food that make our country great. Big Rock Brewery (Calgary), Steamworks Brewing Co. (Vancouver), Garrison Brewing Co. (Halifax), Pump House Brewery (Moncton), Microbrasserie Dieu Du Ciel (Montreal), Le Trou Du Diable (Shawinigan) and Junction Craft Brewery (Toronto) are just a few of the big names in attendance. Les Murray, President of Toronto’s Festival of Beer says it feels great to be celebrating Canada’s 150th birthday at the 2017 festival with Canadian beer. Some delightful things to look forward to in the pavilions include a Smoked Maple Marzen thanks to a partnership between Creemore Springs Brewery and Sapsucker Maple Tree Filtered Water. Blood Brothers Brewing, winner of best fruit beer at the Canadian Brewing Awards in 2017, will be providing their seasonal blend of Paradise Lost featuring mango, guava, yuzu and sauvignon blanc grape juice. Cold beer and rock music are awesome but my favourite attraction at this festival is and always will be the Grilling Tent. 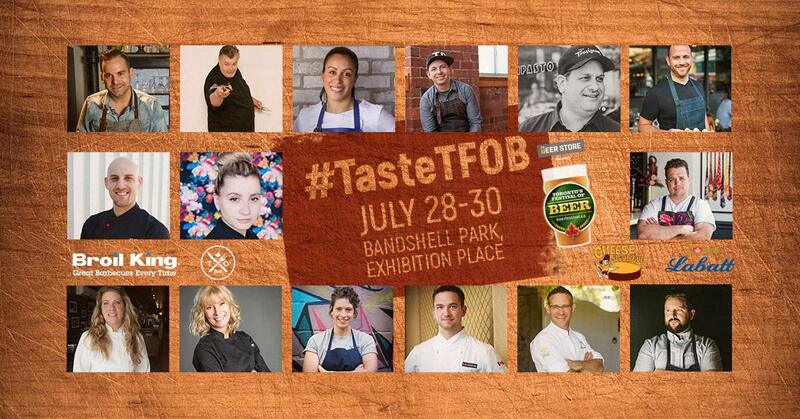 Some of the talented chefs making an appearance this year include Chef Carl Heinrich (Richmond Station), Chef Ted Reader (Ted’s World Famous BBQ), Chef Jason Bangerter (Langdon Hall Country House Hotel & Spa), Chef Alexandra Feswick (The Drake Hotel) and Maître Fromager (and Grilling Tent organizer) Afrim Pristine (Cheese Boutique). Guests can also look forward to an unbelievable musical lineup this weekend including Methodan Redman on Friday night, Sloan on Saturday and Alan Doyle closing things out on Sunday.